It’s no secret that modern technology has drastically changed the world. Children nowadays are intuitively using computers and smartphones. You most likely realize the differences between your childhood and those of the kids around you. There’s probably less unstructured play and more time spent online, playing videogames and engaging in adult-supervised sports and activities. 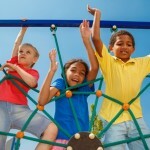 If you have a playground in your facility, pool management may also have the responsibility of optimizing it for play. You’ll recall that unstructured play came to you and your friends naturally when you were young. Whether it was playing superheroes or putting out imaginary fires, it was a time to bond and socialize with other kids your age. One key to encouraging this important childhood pastime is to design a playground that speaks to children in modern times, according to Recreation Management magazine. Here are three tips to keep in mind as you design. 1. Incorporate sound: Technology has inevitably made its way into virtually every industry. Even spray pads can feature ambient sounds. This simple addition adds an entirely new level of fun that kids of all ages will love. This can be especially fitting in a themed playground. Consider establishing an aquatic theme. This way, children who can’t swim can still enjoy water-related play, even if it’s imaginary. 2. Include lighting: This feature will be limited to facilities that stay open later. It can be a good way to usher visitors out of the water and into another play area when the pool has to close because you can rest assured knowing that the moving lights will attract every guest, regardless of age. Of course, this will have a higher initial cost and may not be ideal for every site. Regions that have short days and frequently experience inclement weather wouldn’t be able to use this feature as often as they’d like. 3. Install a spray pad: If you have a wading pool, converting it into a spray pad can incorporate light, sound and interactive water fixtures into one play area. You don’t have to implement all of these features at once. The benefit of spray pads is that you can slowly add on new pieces over time, giving you more flexibility and control over the budget.